Please tell us a bit about the Nicholson Center? The Florida Hospital Nicholson Center is a high-tech training and education institute, focusing on disseminating leading-edge surgical knowledge and techniques for the global community. The Nicholson Center has trained more than 50,000 physicians from around the globe on leading-edge clinical and surgical techniques using state-of-the-art surgical suites and labs, plus advanced medical simulation robotics and learning centers. How did you secure this $5.9M grant from the DoD? This grant originated from a collaborative discussion between Florida Hospital executives, a local philanthropist, and Congressman Alan Grayson. Congressman Grayson wanted to leverage the world-class surgical facility that exists at Nicholson Center to explore new applications for surgical robotics and telesurgery. This allowed the US Army Telemedicine and Advanced Technology Research Center (TATRC) to award and manage a research grant with Florida Hospital on these topics. What were the overall goals of the research? First and foremost, as with most healthcare-related research, our goal was to explore ways to better ensure patient safety. Our research had four key themes: training protocols, remote robotic surgery, simulator effectiveness and simulator design. Each of these categories contributes to the greater picture of progressing the efficacy and safety of robotic surgery, primarily through the universal training of surgeons. What would you say was the most important outcome of the research from this grant? In robotic surgical education and privileging, we led the development of a standard curriculum and testing device for surgeons learning to use the da Vinci robot. This is the Fundamentals of Robotic Surgery (FRS). We leveraged the expertise of 80 of the leading robotic surgeons from around the world to create these materials and they are now available for any educational or certification organization to use. In the area of telesurgery we demonstrated that the current communication latency in hospital IT networks is small enough to support safe telesurgery across a state-wide area. Previous studies had been conducted in different environments, so there was no data on what could be accomplish within a US-based healthcare system. In simulation-based surgical education we demonstrated the level of effectiveness of robotic surgical simulators in a number of unique situations. For example, we dispelled the popular stereotype that avid video gamers might be developing skills which could improve their performance in robotic surgery. Because of the unique mixture of educational and healthcare institutes in Orlando, we had access to large populations of expert-level video gamers for this study. It turns out that video gamers do not perform any better than average administrative professionals when attempting robotic skills exercises. Finally, because we possess and use all four commercially available simulators of the da Vinci robot we were in a unique position to publish several papers which compare the features of all four products. This information was previously very difficult for educational institutes to acquire or assess when choosing a device to incorporate into their educational programs. Our publications on the topic cleared away much of the mystery on the capabilities of these devices. In what ways is patient safety now improved due to the use of the grant? It all comes back to surgical training. We’ve found several outcomes that are helping us better understand the most effective ways to prepare surgeons for complicated procedures. Prior to our research, there was no universal and independent training program for robotic surgeons, and therefore, no procedural standard for safety existed. Now, we developed a comprehensive training program called the Fundamentals of Robotic Surgery Program (FRS) that allows medical professionals everywhere to train for robotic surgery on a universal, effective system. Our research into medical simulator effectiveness also helped determine the best methods for training via simulator, which in turn, creates more skilled surgeons. (a) What role does the Nicholson Center play with new medical device products and simulators? (b) Also, what are the benefits of incorporating simulators into surgeon training programs? One of our research projects looked into designing simulators for optimal training, which helped medical device companies understand the benefits of simulators, and it identified design aspects that are necessary for the best training and repeated rehearsal. Simulators can be much more attentive and accurate evaluators of student performance. Human instruction requires the direct attention of the instructor to evaluate and guide each student. Therefore, the depth of instruction can be highly dependent on the knowledge of the instructor and his/her observational skills. But a simulator “watches” everything that a student does, records it accurately, and presents the consistent scoring and guidance very time. The simulator is always available, always attentive, never misses a detail, and their evaluations are extremely objective. Today’s devices are not as intelligent as human instructors, so they cannot completely replace the human, but they are a fantastic partner in the education process. In your research of medical simulator designs, what design choices did you find to be the most effective for training? Reuse. There are a number of existing simulator systems which contain the hardware and software components needed for new simulators of spinal, neuro, and orthopedic robotic surgery simulators. There is no need to reinvent all of these pieces. There is a very clear case for taking the hand controls from one simulator, the vision system from another, the VR exercises from a third, and the mannequin pieces from a fourth to create a great simulator for a new type of surgical robot. All surgeries are performed by humans using hand-held instruments, some of which are augmented by robotic devices. This means that there are a lot of commonalities in building a simulator of surgery regardless of the type of procedure that is being performed. Our designs take advantage of that fact to reduce the amount of from-scratch work that needs to be done. Now that the grant has ended, what are the Nicholson Center’s next priorities? We will continue to explore the effectiveness of simulator devices, create simulation-based educational courses, study the role of telehealth apps in the medical system, study the characteristics of new robotic surgery systems, and explore new forms of advanced technology in medicine. Where do you see the future of robots in the operating room in the next few years, and how has your research contributed to that future? We have become accustomed to a world in which there is one well known robot in the OR. But these machines are just modern technology assisting the hands and minds of human surgeons. There are currently several different robots already in use in the OR and there are another dozen in the process of invention and FDA approval. The future will contain robotic assistance devices for all types of surgical procedures. These will become more and more integrated into the OR suite until people no longer think of them as futuristic and rare devices. They will just be another form of technology that helps humans deliver care to patients. Also, the Star Trek Tricorder is on the way right now. Once those kinds of devices become widely available, the media and patients will shift their fascination to them. First, we see a greater need for a standard training system, where our research has absolutely laid the groundwork. Once we have a universal method for robotic surgery training, we’ll start to see more innovation in the technology. For instance, our research into telesurgery, or remote robotic surgery, revealed that with today’s IT infrastructure in hospital systems, telesurgery is possible, serving as a major milestone in the future of healthcare. We also expect to see artificial intelligence making its way into the operating room more and more in the next decade. This technology could allow the robot to act as an assistant in surgery rather than just a tool. It could provide warning signs and recall data from previous procedures to make informed suggestions during surgery. 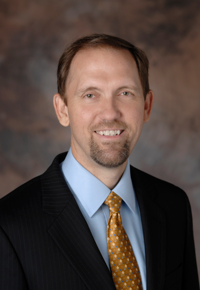 Dr. Roger Smith is the Chief Technology Officer for the Florida Hospital Nicholson Center. He was previously the CTO for U.S. Army Simulation, Training and Instrumentation and a Research Scientist at Texas A&M University. He is on the Graduate Faculty at University of Central Florida and President of Modelbenders LLC. Dr. Smith is focused on bringing innovative technologies into medical education, treatment and services.